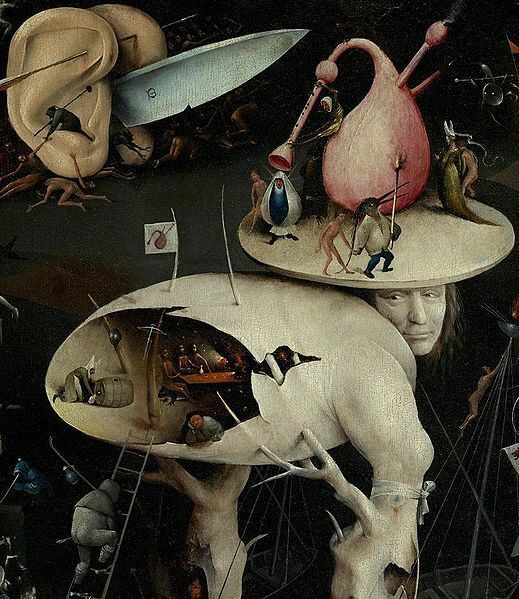 The Garden of Earthly Delights (Detail) - Hieronymus Bosch. The "Tree-Man" of the right panel,and a pair of human ears brandishing a blade. A cavity in the torso is populated سے طرف کی gamblers and drunkards.It's believed that the tree-man may represent the Antichrist. Museo del Prado - Madrid (Spain). Wallpaper and background images in the Fine Art club tagged: painting fine art el bosco bosch el jardin de las delicias the garden of earthly delights.